In the spring of 1995, I spent a lot of time in my grandparents place out on the countryside. It was a remote scattering of houses by the woods, with only two mail boxes registered in the hamlet. My sister and I filled our days picking berries, playing with the animals and rummaging through wooden chests of old trinkets. In the picture painted by most, it was idyllic. At that point Magic was an endless sea of rare and odd cards. There was no web with easy access to spoilers and the Encyclopedia books were yet to be printed. We had played for a couple of months and it felt like any card could exist. Take an extra turn for a mana or two? That could well be a thing. A 10/10 creature? Seems like a schoolyard urban legend, but sure, it could be possible. 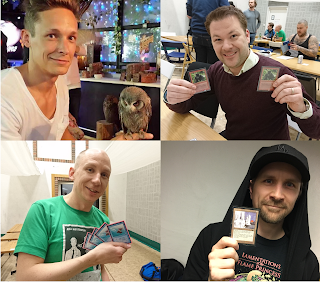 Martin "Fluffy" Lindström is one of the guys I'm more familiar with outside of the realm of Magic. Martin, myself and another guy spent a lot of time together during the second half of 2011 studying Hilbert spaces and functional analysis. It was a notoriously difficult course in graduate level mathematics, boasting a fail-rate close to 90% at the time. It would be my third try on the exam, and Martin's first. From that experience, I was to deduce that the man is a damn brilliant human being. In the end, we both managed to pass the course and I got to learn a lot from him.